2014 was a tough act to follow. All across our roster there was national airplay, international touring and a huge amount of creative activity. But we hit the ground running. In 2015 we got serious. Our show on Fab Radio International moved to the 7pm Monday prime-time slot in January and our technical wing over at WR Audio began work on building an ambitious studio complex. Though always a quiet month for releases, this didn’t mean our artists were laying low – indeed, you might even have seen Felix Hagan smashing up a lute on Jack Whitehall’s ITV sitcom Cockroaches. In February the much anticipated sophomore LP by Snowapple went on general release, receiving great responses from both critics and audiences alike; the group toured the album all over the UK, mainland Europe and the USA. Meanwhile in our home town of Manchester Becca Williams collaborated with Beth Orton as part of Band On The Wall’s Artistic Directors series and Honeyfeet appeared with Billy Bragg at Manchester Academy’s Music Beats Austerity event. 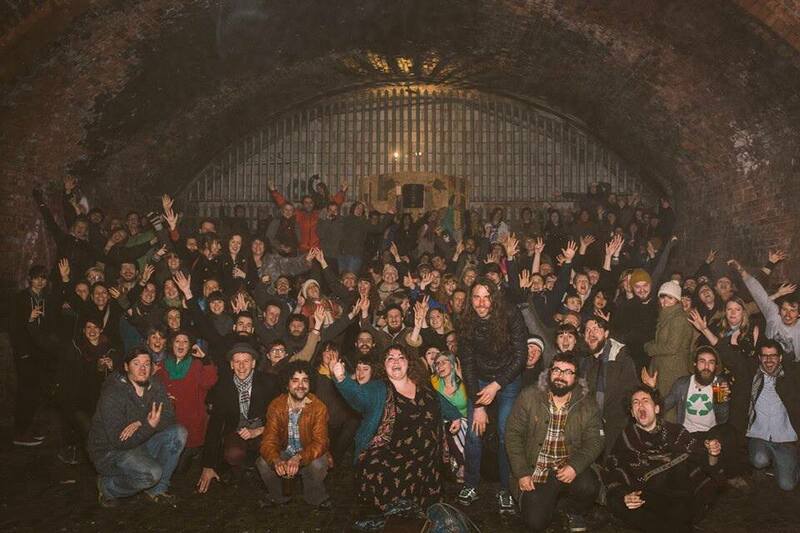 March saw WR Audio team up with Kris Extance and a huge array of Manchester independent artists to film and record live sessions under the name Sessions Of March – the first of multiple archiving sessions showcasing the region’s best underground talent. Naturally many of our roster and affiliates were involved, including Walk, Honeyfeet and Louis Barabbas. The following month Louis Barabbas lifted the veil on a few numbers from his upcoming solo album with the release of an unplugged EP as well as announcing a new musical he was working on (hopefully to be staged in 2016). In May Ivan Campo embarked on a tour of Spain whilst the rest of our roster got together for Creative Tourist’s Manchester After Hours event. Felix and Louis co-wrote a song to mark the publication anniversary of Virginia Woolf’s Mrs Dalloway – the song was then recorded in front of a live audience at the Central Library and featured in the Telegraph’s recommended attractions of the night’s UK-wide event. Check out the result here. That wasn’t the only Open Recording Session we did that Spring. The following month T. E. Yates and a six piece band laid down three new songs at the Eagle Inn (Salford), whetting people’s appetite for his debut LP. Further afield Louis and Felix embarked on Debt’s first House Concert tour, playing intimate shows all across the country (their tour diaries can be found here and here). June wasn’t all fun though: Alfie the dog, beloved mascot of the label from the beginning (and star of the Bedlam Six‘s Living In The Aftermath video) sadly passed away. Over the Summer months festival season was the primary call to most of the roster, particularly the Bedlam Six who ended their hiatus to play events in Belgium, Germany and the UK. Back home Walk were the stars of a new Open Recording Session (once again at The Eagle Inn, this time also filed by Manchester documentarians Matter Of Sound for a program all about our pub studio events). As Summer turned to Autumn attentions shifted back from the live to the recorded. Louis Barabbas’ first solo single You Did This To Me evidenced a surprising new direction while T.E. Yates chilled everyone to the bone with his new animated video for Evil Cat. Back on the live circuit, Richard Barry took a couple of weeks away from his new found parental responsibilities to tour UK houses (once again with Louis Barabbas). The next tour was slightly more exotic – in October Snowapple headed over to Mexico, a last hurrah before a hiatus instigated by Una’s impending motherhood. Back home saw the release of Alabaster dePlume‘s long-awaited new LP Peach and a collection of stripped down Bedlam Six recordings by Louis Barabbas entitled Bedlam Solo. November saw Felix Hagan & The Family go pop with the release of their ebullient new EP Kiss The Misfits, complete with two accompanying (and markedly different) music videos for the title track and crowd favourite Some Kind Of Hero. That month also saw the Bedlam Six dip its collective toe in the choppy waters of modern technology with their first live streamed concert. The event (which also featured Felix) was broadcast live from WR Audio’s studio to an online audience that included viewers in the USA, Australia, Central Africa, Germany, France, Spain and the UK. It was particularly memorable for the amount of times Ozzy the studio dog invaded the stage. In December we had some wonderful non-musical news, Una Bergin from Snowapple gave birth to a baby boy (Debt’s third roster child!). The band also released a fantastic cover of Jolie Holland’s Old Fashioned Morphine which they gave away for free. The WR Audio studio is currently being expanded to include a live room the size of a semi-detached house. Louis Barabbas is poised to release his new solo album Gentle Songs Of Ceaseless Horror. The Bedlam Six are gearing up for a Spring tour of Europe and a new album, plus a collaboration record with poets from Salford’s prestigious Evidently spoken word night. Honeyfeet are currently putting the final touches to their new album and it’s sounding amazing (obviously). T. E. Yates has begun work on his first full length album Silver Coins And White Feathers, produced by Biff Roxby. Richard Barry is about to start recording his next album (which he promises won’t take nearly as long as the last one).